Oliver McMillan’s CEO, Dene Oliver, asked me to create a product in line with the company’s marketing rollout that could be distributed to our employees in branches statewide. His goal was to improve the work culture at Oliver McMillan, and tasked me with reading and analyzing ” A More Beautiful Question” by Warren Berger in order to parse out the relative concepts that pertained to OM’s work environment, and ultimately incorporate these concepts in my final product. After multiple meetings with the Chief Cultural Officer and marketing teams, we decided that creating a bookmark was the best course of action. After creating the bookmark, I met again with the marketing team to work on the design of the final product. It stayed similar to my original design. 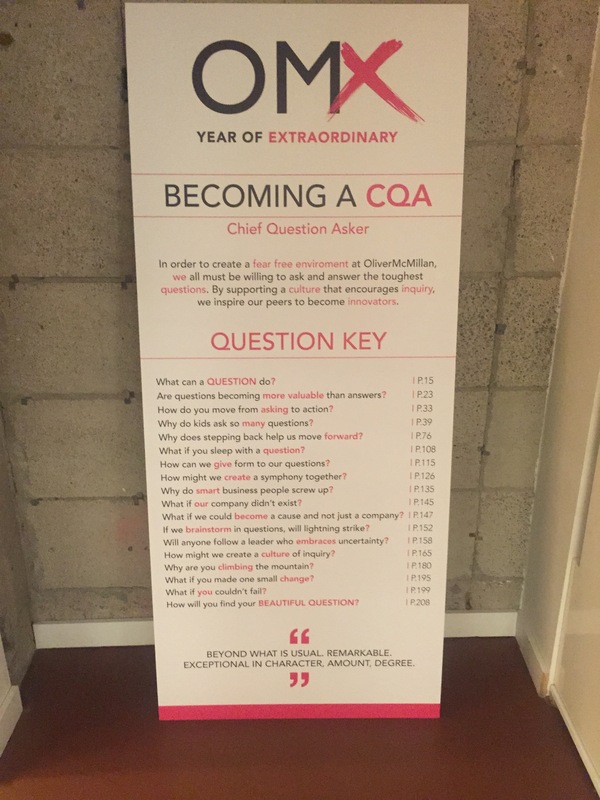 I presented the bookmark to all employees at the main office which included the CEO, CFO, President, and CCO, and discussed how we can create a fear-free environment at Oliver McMillan.